Why did Teri draw sea turtles? For one of the few times, she had finished a drawing and there weren't any flowers blooming in our yard. Our kids talked her into taking a trip to Sea Life Park (a marine attraction in Windward Oahu) to sketch out some turtles and this was the result. "I'm not sure how I originally found it, but I have read some great stuff about your great prints and cards in the newsgroups." "I received my prize and I love it. The cards are beautiful. Thank you so much." 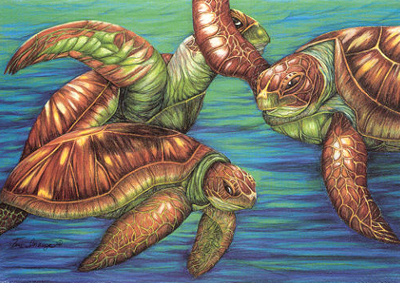 SCM-TURT Double Matted Note Card $13.50 Click here for ordering information (write in the comments section the name of the card you would like). SCK-TURT Double Matted Note Card framed in Koa $40 Click here for ordering information (write in the comments section the name of the card you would like). IJP8-8 14" x 11" Double Matted Print $28 Click here for ordering information. IJP8K8 15 1/2" x 12 1/2" Double Matted Print Framed in Koa $67 Click here for ordering information. IJP-8 20" x 16" Double Matted Print $45 Click here for ordering information. IJPK8 21 1/2" x 17 1/2" Double Matted Print Framed in Koa $101 Click here for ordering information. GIC-TURT 13" x 10" Giclee Print $200 Click here for ordering information. GICK-TURT 17" x 13" Giclee Print Framed in Koa $250 Click here for ordering information.